Ina Garten is best known for her wildly popular Food Network show The Barefoot Contessa. 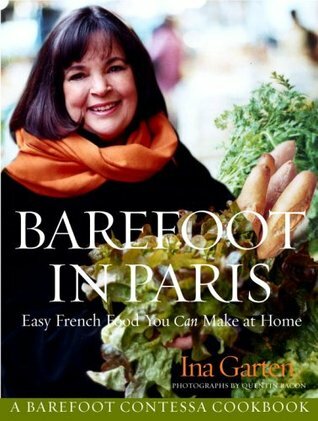 Barefoot in Paris takes her to France where she proves just how easy French cooking can be. So often we think of French food as fancy and complicated, but every recipe in this cookbook has minimal ingredients and simple steps, making the home cook feel comfortable navigating French cuisine. Not only are the recipes simple, but so are the page layouts and photographs. There is very little fanfare on the page, emphasizing the theme of simplicity. My one criticism of the book is that most of these recipes have already made an appearance on her show, so there is nothing new or exciting that Ina brings to this cookbook, other than it's just a collection of her already aired recipes. Seeing as how I can pretty much access all of these recipes on foodnetwork.com, there isn't much motivation for me to actually purchase this cookbook. It is, however, a lovely book to peruse at the bookstore or check out at the library. Since I don't watch the show, this might be a good way to get French cooking into my kitchen. I keep meaning for that to happen and it hasn't yet. Simplicity might be the answer. I haven't seen her show either, so a book with all the recipes in one place would hold more appeal. Thanks for the introduction to Ina. I love Ina Garten's recipes and even though many of her recipes are available on line, I still wouldn't hesitate to buy! I have several of her books, but I'm not sure I own this one. I use so many of Barefoot Contessa's recipes, she is one of my favorites. I had this book on my wishlist for quite a while so good to read your feedback. Perhaps I will just check it out from the library instead.